Red Comet Announces the Addition of Several New High School Courses in Science. Red Comet, an Accredited Online School, Adds New Enrichment Courses in Science. These Courses are Available to Students Across the United States for Credit. Red Comet has unveiled several new courses in the subject area of science. For the 2014-15 school year, students may enroll in new enrichment courses, including Anatomy, Marine Science, Physiology, Physical Science, Comprehensive Physics, Comprehensive Chemistry, Comprehensive Earth & Space Science, and Comprehensive Biology. These courses allow students to advance their knowledge in this subject area by delving deeper into key scientific and research material. Students who want to explore potential career prospects in the field of science will find the curriculum rigorous and interesting. Red Comet is a Fully Accredited (NWAC, AdvancED) organization that has been offering online courses for credit since 1999. Students have over 175 courses to choose from. Many of these courses are also approved by the NCAA organization. 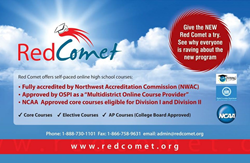 In the State of Washington, the Office of Superintendent of Public Instruction (OSPI) has approved the Red Comet program as a “Multi-District Online Provider,” “Online Course Provider,” and “Online School Program.” In a statewide survey, Red Comet received high ratings for student satisfaction. Students use the Red Comet online program for original credit, credit retrieval as well as credit recovery.